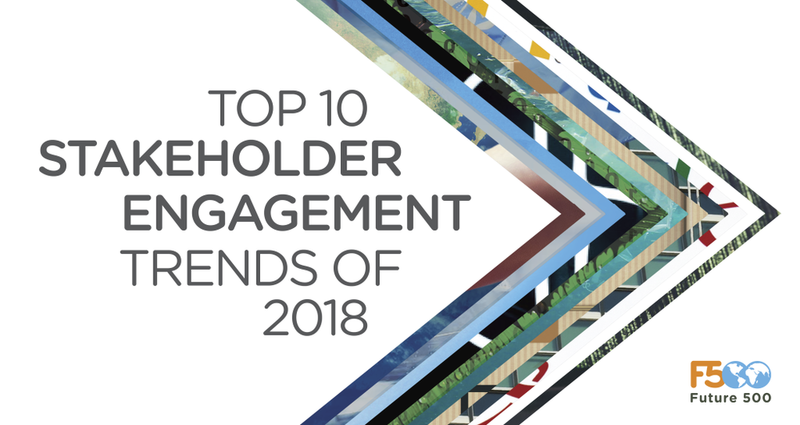 We are pleased to release Future 500’s Report on the Top 10 Stakeholder Engagement Trends of 2018. This is our seventh annual report. Each year, our team pools their expertise and perspective to identify ten social, environmental, or economic trends likely to shape engagement between companies and external stakeholders in the coming year and beyond. Technology and Big Data have bridged much of the divide between corporations and their stakeholders. Political vacuums are foisting CEOs and brands into leadership roles all around the world. Our report offers corporate leaders a detailed peek ahead, with specific engagement strategies to meet the risks + opportunities of corporate stewardship head-on through 2018 and beyond. Environmental justice goes mainstream, putting stricter micro-level demands on corporate sustainability. Global standards from COP21 and the UN’s Sustainable Development Goals are internalized on state, local and corporate levels—now, these groups must measure real-world operations against these goals. Sign up for Future 500's newsletter? You'll hear from us about once a month, and can unsubscribe at any time. Thanks for your interest! Click here to download your copy our 2018 Trends Report. Want to dive deeper into any of the issues discussed in this report, or explore guidance and best practices for stakeholder engagement? Contact Kellen Klein, Director, kklein@future500.org. For media inquiries, please contact James Glave, Senior Advisor, Communications, jglave@future500.org.